How will I receive my Mobile Transfer tickets? What are mobile transfer tickets? Some venues prefer to use paperless tickets or mobile transfers for entry because it’s a more secure delivery method than traditional PDF print-at-home tickets. Mobile transfer tickets can also be referred to as a "Mobile QR code". 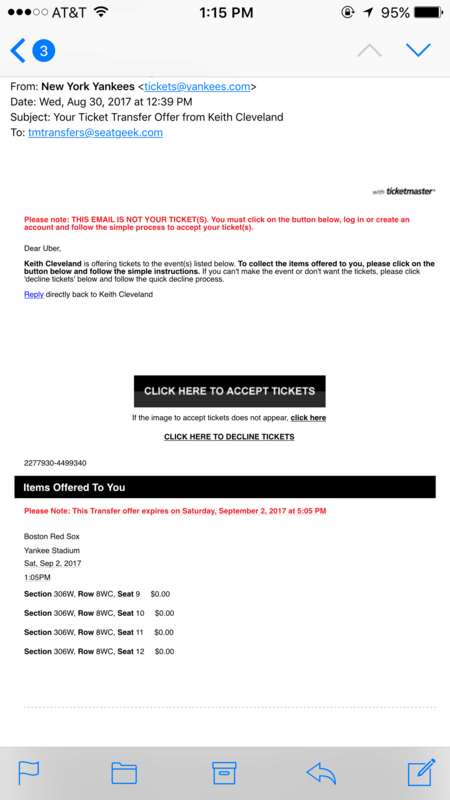 Note: These kinds of tickets will be delivered outside of SeatGeek within the venue’s or team’s preferred ticketing platform. Mobile transfer tickets can’t leave the platform on which they were created, so you’ll be required to set up an account with a third party to have access to them. Mobile transfer tickets also won’t be printable, and they’ll need to be scanned from a mobile device to be valid for entry. I haven’t received my mobile transfer tickets yet. Depending on the venue, some tickets are not available until closer to the event. This is what is referred to as a “Delayed Release.” This practice is implemented to help protect peoples tickets from potential fraud. However, your tickets will be on their way shortly! Keep an eye out for an email from either Ticketmaster or from the team prompting you to accept the tickets. I can’t find the email with my mobile transfer tickets. We have a couple of tips for you! 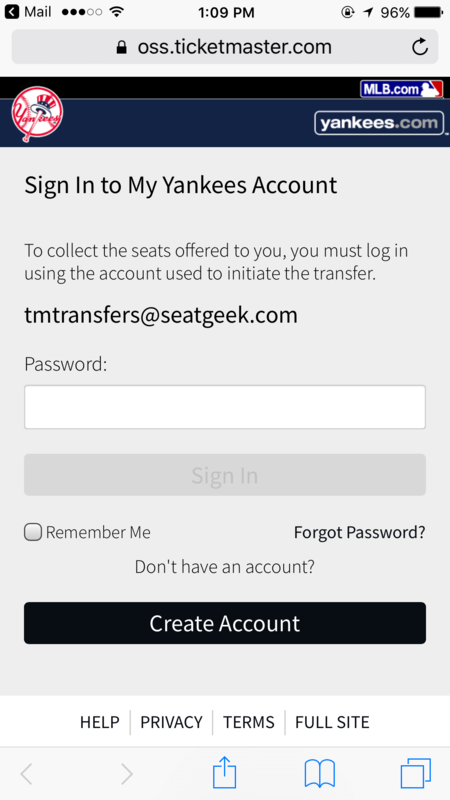 The invite to claim your mobile transfer tickets will be sent to the email address used when placing your SeatGeek order. 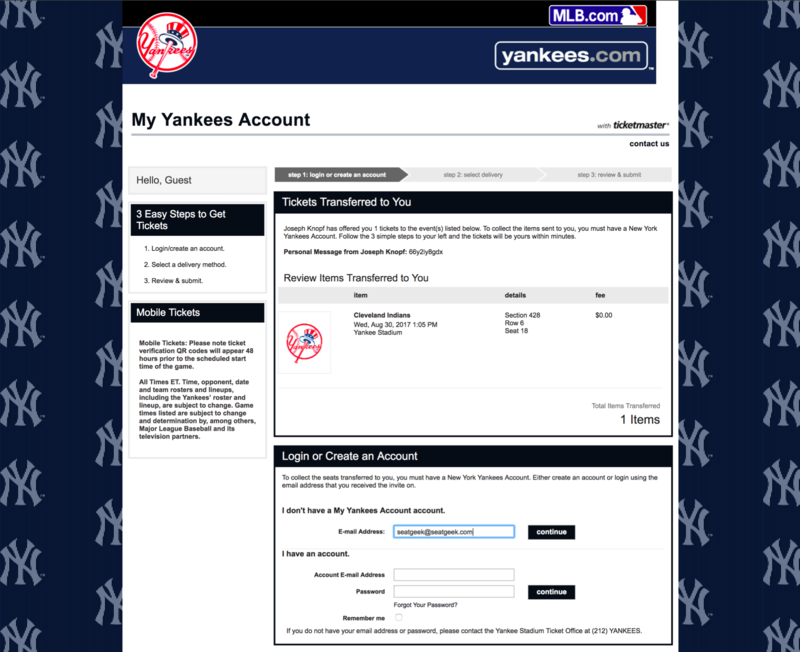 Once you locate the email with your ticket transfer, follow the simple prompts within the email to access the tickets. Still can’t find the email? 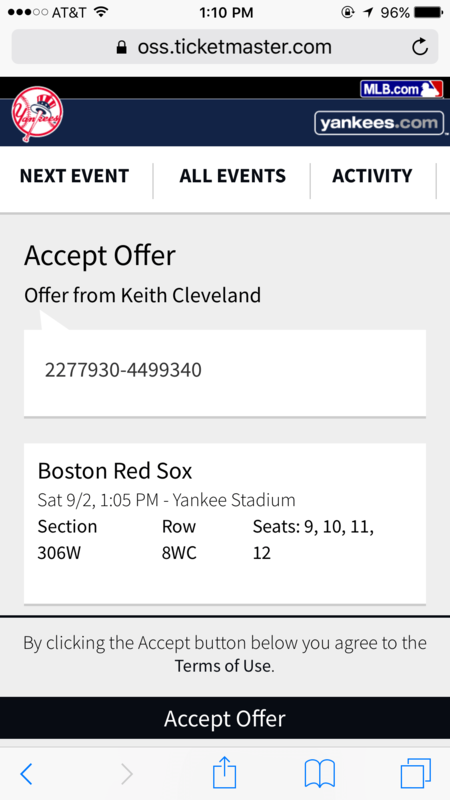 Sometimes, the tickets will come directly from the seller so rather than searching your inbox for “SeatGeek,” try searching the home teams name (Example: For Red Sox vs Yankees, search for “Yankees”). If that doesn’t pull up an e-mail try searching for the word “transfer”. 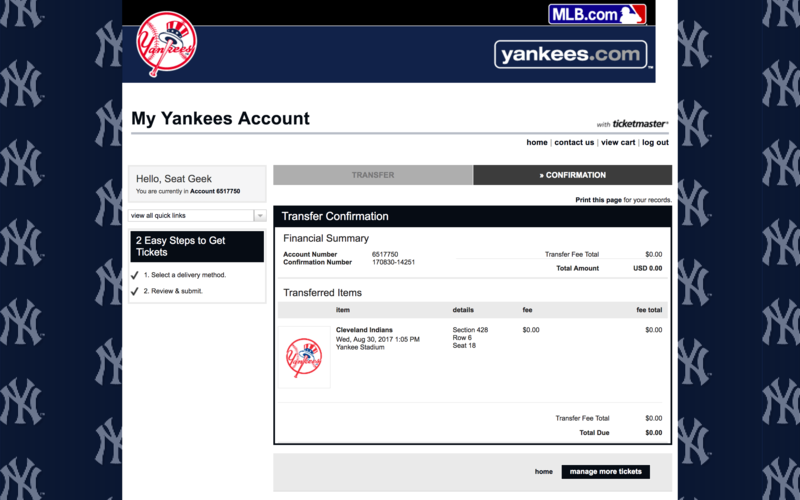 If you still cannot locate the transfer e-mail after completing these steps, please reach out to us at hi@seatgeek.com so that we can assist. Important note: Mobile Transfer tickets will be sent to you from a third party, often Ticketmaster™ or the team or venue directly. They will not be delivered in your SeatGeek app. 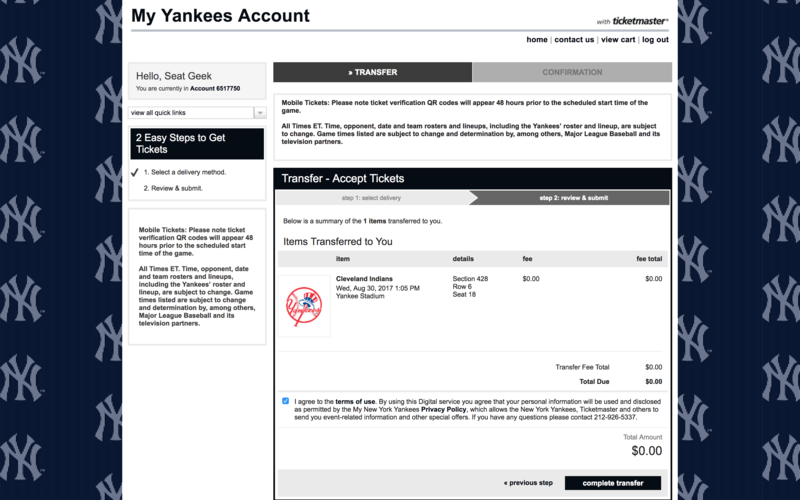 How do I accept mobile transfer tickets? Important note: Before accepting the mobile transfer, please be sure you are logged out of all existing TicketMaster™ and Team Account Manager Apps in order to avoid accepting the transfer to a different account. After clicking the link in the email, you may need to create an account on their website to claim your tickets. Once you’re in your account, you’ll have to acknowledge that the tickets must be displayed on your mobile phone. And when you get to this confirmation page, you’re done! 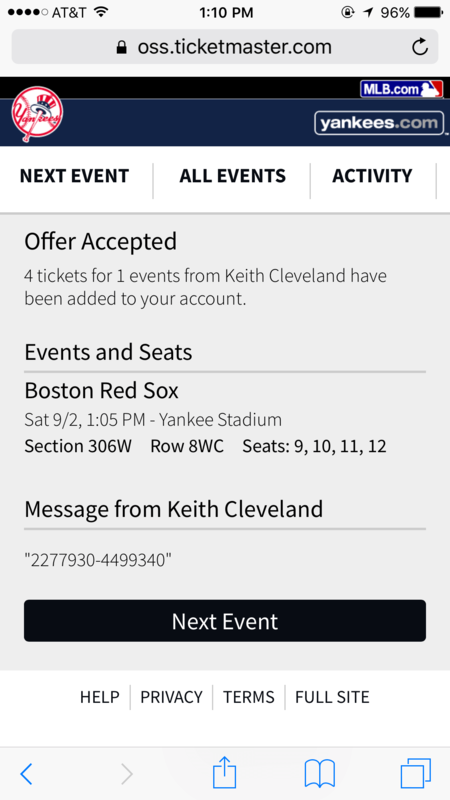 Once these tickets are added to your account, you'll need to download the relevant third-party app in order to scan into the event with your mobile device. Below, you can find a download link to the app that lets you enter your event. And depending on the event, you may be able to add your ticket to Apple Wallet or pull up your ticket on your phone’s web browser. Sometimes the tickets or QR codes are not viewable until the day of the event. This is a policy enforced by venues to keep your tickets safe. Rest assured as long as you’ve accepted those tickets, they are yours and barcodes will appear either via Ticketmaster or the team’s app in time for the game. Can I change the format of these mobile transfer tickets? The venue determines the format of the tickets. 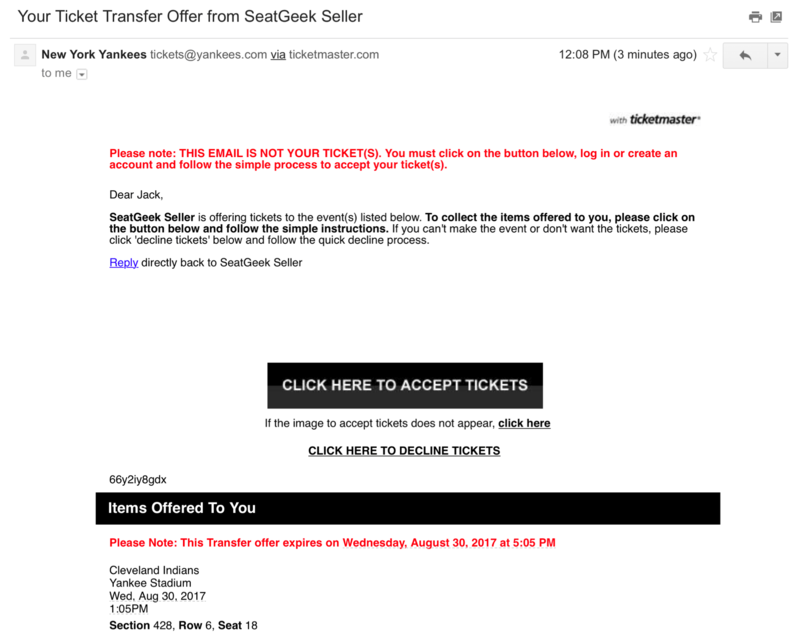 This means SeatGeek cannot change the delivery format. This will be the method of entry for the majority of attendees to your event. Can I get a refund or cancel my order? Will my purchase be in USD currency? What are the seat numbers for my tickets? Why do my tickets have someone else's name on them? Can I use my phone to get into the event? My tickets say "Not valid for entry via mobile device", what's up with that? How do I contact someone about a question or problem with my order? I received a pre-paid gift card in the mail. Is this my ticket?